India and China held their first official dialogue on Central Asia focusing on their “very similar” approaches to regional and energy security in the strategically important region. The two-day strategic talks concluded on Wednesday. An Indian embassy statement in Beijing said the talks were “held in a cordial and friendly atmosphere marked by a high degree of candour”. Senior officials of the Foreign Ministries of both countries discussed the situation in Central Asia, “focusing on the very similar” Indian and Chinese approach to political and economic relationships with Central Asian countries, it said. The talks were held in the backdrop of an imminent NATO and international troops pullout from Afghanistan in 2014 that has sparked concerns of a return of unrest to the region. “They had a conversation on specific issues like regional security and counter-terrorism, Shanghai Cooperation Organisation, (SCO), energy security, development partnerships, and people-to-people contacts with the countries of the region,” the release said. The Chinese side briefed the Indian delegation on China’s vision of its relations with Central Asia while the Indian side described details of India’s “Connect Central Asia” policy, it said. Trade between China and Central Asia has increased from about $500 million in 1992 to $26 billion in 2009, according to official Chinese figures. The Central Asia-China gas pipeline runs all the way from China’s east coast cities to Galkynysh field, a distance of 6000 miles as it sources energy from major energy producers Turkmenistan, Kazakhstan and Uzbekistan. 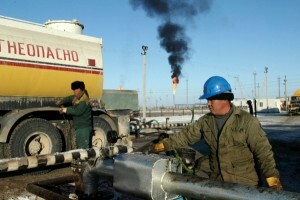 China’s energy giant CNPC also plans to integrate Afghanistan into this energy network. Indian bilateral trade with Central Asian Republics stood at $500 million in 2011 but a new trilateral memorandum of understanding (MoUs) between Iran, India and Afghanistan is set to facilitate India’s access to Afghanistan and Central Asia. “Both India and China are in the neighbourhood of Central Asia and have established close political and economic ties with the countries of the region. Both countries stated that strong relationships with the countries of the Central Asia region were an important priority in their foreign policy,” the release said. The dialogue on Central Asia was followed by the first ever talks held by the two countries on Afghanistan. China and India have held similar comprehensive dialogues on Africa, West Asia, and counter-terrorism issues, the release said. The Indian delegation led by Ajay Bisaria, Joint Secretary, Eurasia Division of the Ministry of External Affairs, also called on Chinese Vice Foreign Minister Cheng Guoping. The Chinese side was led by Zhang Hanhui, Director General, Department of European-Central Asian Affairs. The next round of talks will be held in New Delhi.